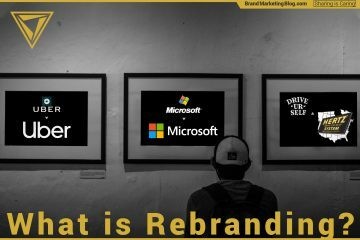 What is vertical branding? 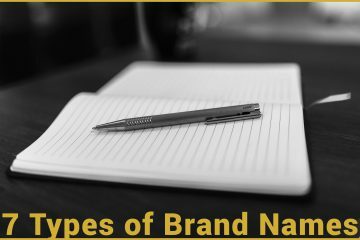 What is horizontal branding? A vertical branding strategy strives for better products, while horizontal branding strategy pushes for different. Vertical branding is when a company differentiates itself as “better” on an objective scale like miles-per-gallon, megapixels, etc. For example, Hyundai chose a vertical brand strategy for its IONIQ hybrid car touting it as “the most fuel-efficient car in America” with it’s 58 combined mpg. Horizontal branding is when a company differentiates its product as “different” and subjectively more appealing to some people. For example, MINI plays up it’s fun and quirky perception to appeal to stylish people. These strategies are not mutually exclusive. Most companies start with a vertical brand strategy and move to a horizontal brand strategy when the marketplace is established. 3 minute read | 650 words. A company with a vertical brand strategy utilizes a technology, material, structure or process that makes the product better in some objective measurement. These objective measurements include horsepower, gigahertz, miles per gallon, etc. For example, Nikon’s D4S features a sensor capable of 100 to 25 600 ISO. 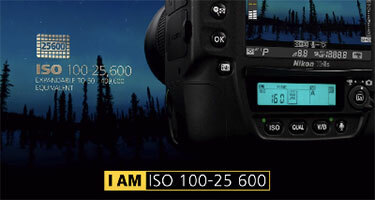 A camera’s sensitivity, or ISO, is an objective measure of performance in low light, regardless of other subjective features of the camera, like position and feel of the buttons. I company with a horizontal brand strategy uses design, engineering, or associations to make their product more appealing to the needs of certain types of people. There is no objective way to rank their product; some people will like them, others will not. 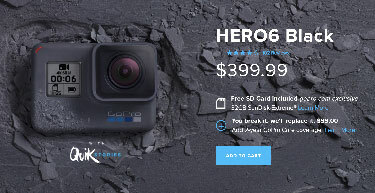 For example, GoPro made a rugged camera. Ruggedness is a subjective measure; it depends on the person whether they would define a rugged camera as a better camera. An action sports enthusiast will appreciate a tough GoPro, while a portrait photographer wouldn’t. Demographics will force you to change. I visualize it as cartesian access (see below). The vertical access, i.e. the y-axis, is the quality of the product which is generally the same as the cost. The horizontal axis, i.e. 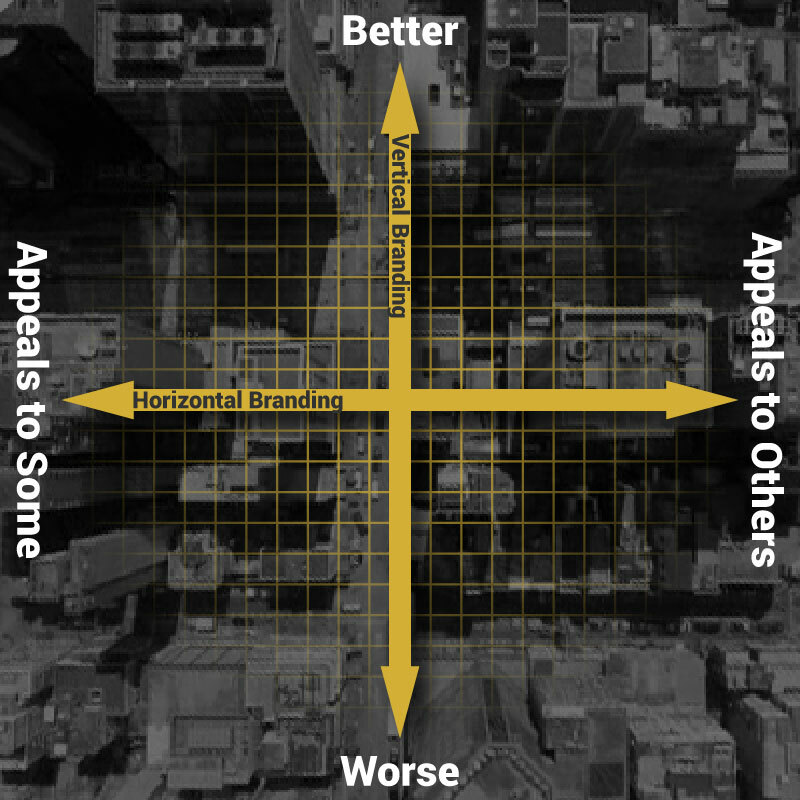 the x-axis, is for taste or preference. Some people may like something on one side, and other people may like something from the other side. Vertical branding and horizontal branding are not mutually exclusive. Many products have high-performance measures that they promote, but also subjective aspects that they also mention. Historically, most brands have followed an upside down “L” pattern. A startup company makes a product with better technology and shouts that advantage from the rooftops. When they are established in the marketplace, and their competitors have caught up, they pivot to a horizontal brand strategy and make themselves different while still trying to be better. For example, early Apple came out with the first color personal computer, but they quickly moved into a strategy of appealing specifically to creative professionals. Another example is Samsung Galaxy. For the first decade of the smartphone revolution, Samsung was out front in objective measures like processor speed, screen resolution, and camera sensor resolution. That was a grand marketing strategy when a faster phone translated into a better experience, but now the technology has slowed down, and any improvement in speed is just icing on an already tasty cake. They have now pivoted to court the video content creators, social media influencers, and in turn millennials. Forbes: Vertical Brands Crash. Horizontal Brands Fly. All You Have To Do Is Ask.